This is the first year that Samsung has employed a unibody design in its flagship Galaxy S line sealing the smartphones completely. While it was always possible to change the batteries of your Galaxy S phones when they start fussing up, it won’t be possible any longer. Powered by a 2,550 mAh battery, Samsung Galaxy S6 and S6 edge sport a power consuming Quad HD display, high-end Exynos 7 octa core processing chipset and other such top notch features. However with strong features comes stronger toll on the battery too. 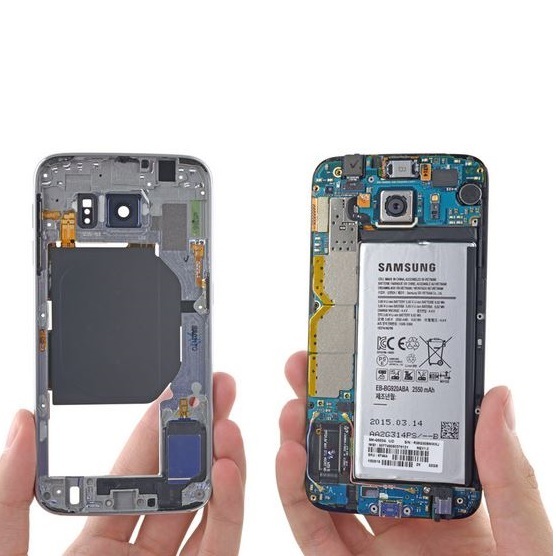 Here is how you can fix Galaxy S6 battery problems with simple and easy tips without having to lament over the impossibility of changing the Samsung Galaxy S6 Battery . Here are some of the tips to help you fix Galaxy S6 battery issues; these tips also work on Galaxy S6 edge and other Android flagships as well. There are many apps running in the background even when you don’t use them. Find out these and close them. Third party applications are one of the biggest reasons – possibly after communications – responsible for a reduced battery life. Go to your Samsung Galaxy S6 or S6 edge Settings and in the battery session, look at what apps are eating out the most of your battery life. If you find the culprits, either force stop these or uninstall them altogether. Reinstall the essential apps to see if the problems is fixed. It is always recommended to restart your gadgets if you are facing any kind of performance, battery, or heating issues before resorting to any other solutions. Hold down that power key and turn the phone off. This simple Android tip might help you solve some battery and heating issues. In times when you are in no need of Wi-Fi, Bluetooth services, NFC, GPS, or even the cellular data, never forget to turn these services off. These services slow down the devices by constantly updating and hence draining battery life. 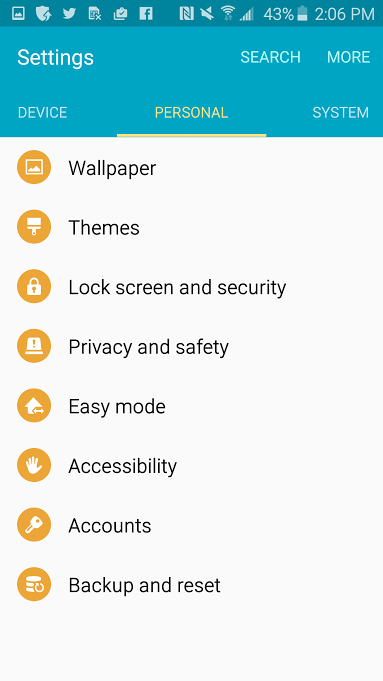 Simply turn these off from the Settings whenever you don’t need them and make a habit of only switching them on when you actually need these services. We don’t necessarily need the location services unless we are using maps or any other app using the location. It’s easier to enable location when you are using any such apps. Consider turning it off otherwise to increase the battery life. Go to quick Settings and disable location services. From Settings > Personal > Wallpaper > From Gallery, choose a black Galaxy S6 wallpaper. You won’t find in the default option but you can always find one online or create one for yourself. Thanks to how Samsung’s AMOLED screen consumes power, you will notice some difference in battery life after switching to a black paper. This is a very simple solution to speeding up your Samsung Galaxy S6 or S6 edge with more impact on performance than the battery itself. If you are suffering from sluggish device, try uninstalling unused apps. This will free up space on your device and run your gadget faster. Focus on deleting larger games which take up lots of space. For most of the games like Temple Run, information is still saved in the Game Center. Hence, if you decide to play them again, no worries of starting from scratch. Receiving notifications for every single app is not only annoying but also eats up resources of both data, battery and the processing speed. Make efficient use of notifications and disable them for apps you don’t require notifications for. 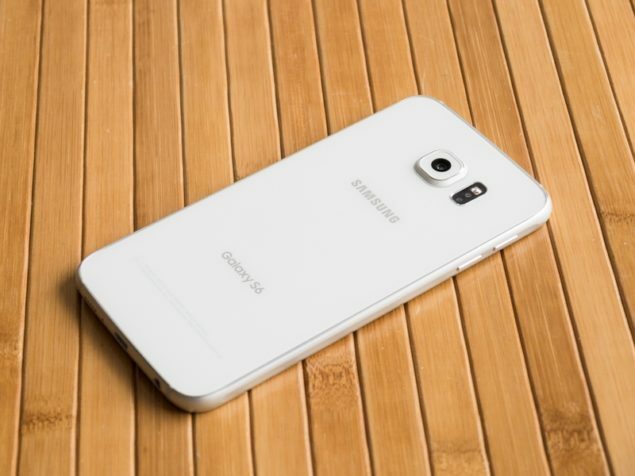 If none of the above tips work for your smartphone, it is time to go for the last resort: factory resetting Galaxy S6. Go to Settings > Personal > Backup and Reset to factory reset Galaxy S6 duo. Because factory reset wipes off all the data on your gadget, keep a backup before proceeding. In case even factory resetting Galaxy S6 or S6 edge doesn’t seem to work for you, it’s time to possibly buy a battery pack. Go to Settings System> > Battery and you will spot two default battery saving options: Power saving and Ultra power saving modes. The first one of these limits the maximum CPU performance, reduce brightness, and do other such small things here and there to increase the Galaxy S6 battery life. It doesn’t stop you from using anything, it simply cuts down on fancy things like vibration and screen on-time. The Ultra power saving mode, on the other hand, is designed to be enabled at the very critical times when you need to save every drop of the battery juice. 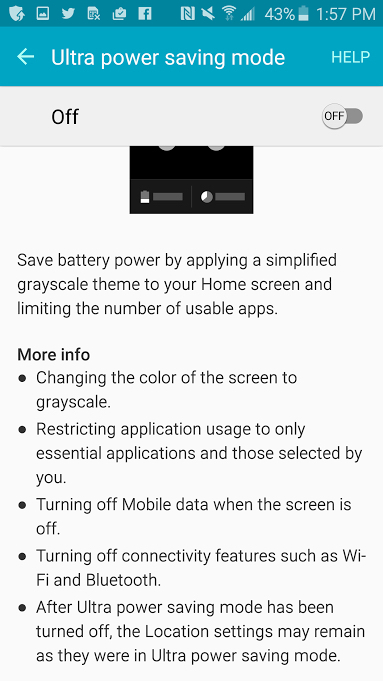 This mode brings your device to a grayscale theme along with limiting the number of apps you can use. Both of these do work so use them when you are out of home and need to save on the battery as much as you can.